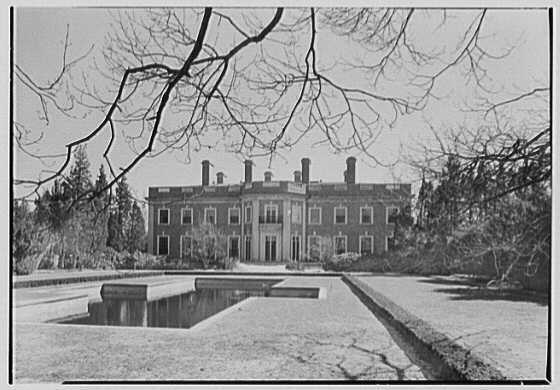 'Mallow', the Walter Farwell estate designed by William Welles Bosworth c. 1918 in Oyster Bay Cove. Farwell was the son of Charles B. Farwell, United States Senator from Illinois and was vice president of John V. Farwell & Co., a dry goods firm. Today the estate operates as the East Woods School. Click HERE to see 'Mallow' on google earth and HERE on bing. Click below to see 'Mallow' undeveloped in a 1953 aerial shot. Pictures from the Library of Congress. How cool! This is the first time I've ever seen these rooms by Ruby Ross Wood- and the first time they have ever been shown publically. A small sitting room (not shown in your pix) in Mallow has been somewhat famous since 1974 when Billy Baldwin published his own snap shot of this room in "Billy Baldwin Remembers". 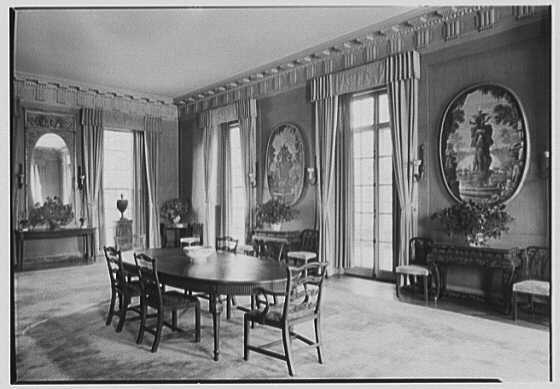 He stated that the color of this room, "Coromandel black-brown," and its lacquered finish was the original inspiration for the paint treatment of the walls in his now famous, forever copied and much photographed studio apartment. Thank you O.L.I. you've completed the picture! Mallow has been one of my favorites houses ever since I saw a picture of it online somewhere. Great pictures. I only know this place from a child's perspective and playing sports against East Woods. I remember the whole setting as a bit enchanted. I've always been crazy about this house...nice gutsy early Georgian. 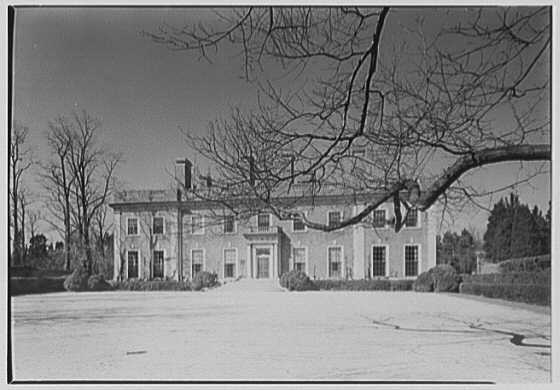 I've just sent you a copy of a 1920 real estate ad for the house, which says that the brick came from a demolished plantation house in Virginia (I wonder which one? ), and the staircase from the Bulwer Lytton house in England. The Farwells certainly had above average taste. I didn't see a link here, but I'd swear that you also posted a real estate brochure of Mallow some time back? What do you suppose of the two pieces of Art in the dining room?. Painting?, tapestry?. What's the motif?. 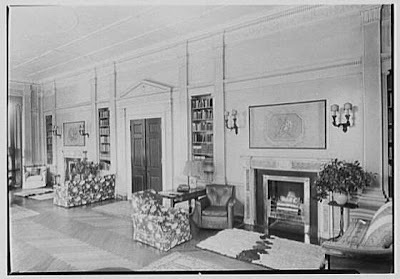 With the possible exception of the half round rug in the stairhall, I was quite taken with the interiors. Thanks for the exceptional post! This is such an elegant house! 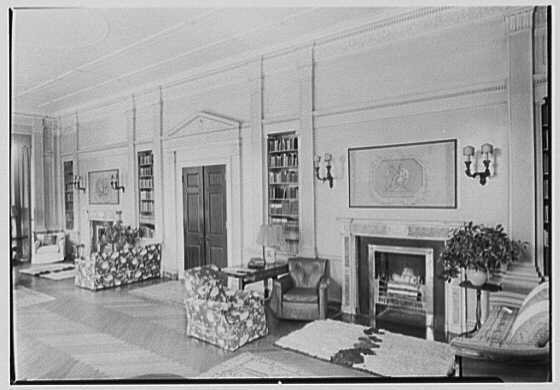 And the interiors are not only elegant but look surprisingly comfortable in a formal sort of way. Actually John J, that half round rug, which appears to be an 18th century Aminsister, is an example of what, for me, was Mrs. Farwell's boldness in taste---beauty over perfection----I suspect the colors were faded and beautiful. This is the house were the original idea for a Lacquered Chocolate Brown room came from??? The concept that every major decorator has done and re-done over and over for decades? How fascinating-please show us the room and tell us more! A fuller view may be found in Billy Baldwin's own books. I have been through the house many times and since it became a school it has been instutionalized. as the other first floor rooms. I also believe the sculptures and antique marble fireplaces were sold. And finally the large cross shaped pool to the rear has been filled in. 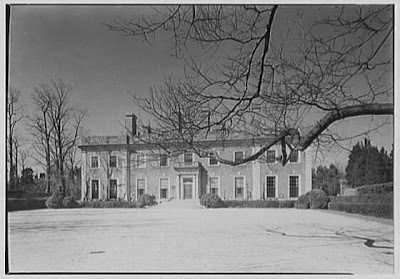 The owner of this beautiful estate was my late husband's great Aunt Mildred. His father was the estate executor. My sister-in-law and my husband remembered playing hide and seek there when they were little, before it became a school. They said there was a bookcase in the library that swung around, just like in those old movies ! Mr. Farwell was blind..result of two seperate accidents. In the late 30's and early 40's my Mother read to him on a regular basis, especially material that would prepare him for his next trip somewhere in the world. Nothing was ever moved in his library and he could walk around the room as though sighted. Another outstanding post, Zach! I have written a roman à clef about going to school here in the late sixties, as well as Mona Bismarck and Balenciaga, and her life in Paris. Fitzgerald and his oeuvre get a lot of play in the narrative arc, as both Mona and my aunt and uncle, the screenwriting Hacketts, were close to Scott. The hot link goes to my pinterest page with contemporary photos of "Mallow." I am a teacher at this magnificent school. The building is just as beautiful and very well maintained. Yes, changes have been made to benefit the students and for safety. It is an amazing environment to behold. A warm and inviting place. Thank you for sharing the photos and the history of this magnificent mansion. I would love to see more. I'm the new Head at the school, East Woods School. 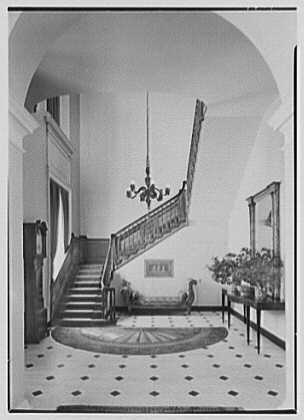 The mansion still retains so much of its original beauty. We love and cherish it. Does anyone know the story behind the carvings in the top of the limestone entrance? Our students (and we) are curious. We have a parent here who is the son of an Italian stone mason and he himself works in stone restoration and cleaning. When I asked for expertise to advise me how to clean the columns and front balcony of stains from the acid rain, he volunteered and cleaned it this past weekend. It looks so much better, as a result! Some hint of the stain lingers--I wish it had been cleaned on a regular basis and then probably it could have been rendered stain-free, but the improvement is dramatic. We are also considering ways to restore the library to as much of its former beauty as possible.